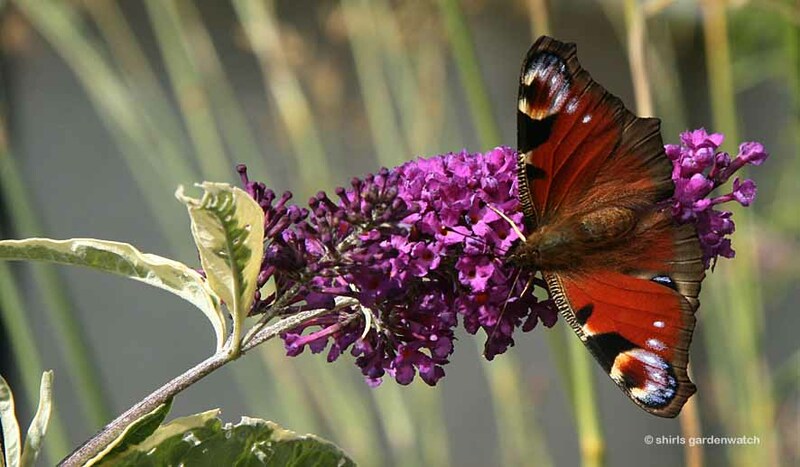 I never see large numbers of butterflies visit my garden at any one time and I’ve only seen a few species. Seen (so far) here in my small Scottish Garden have been Red Admirals, Small Tortoiseshells, Peacocks, Painted Lady’s & Small Whites. However, as regular blog visitors might expect, I do try my best to encourage wildlife to visit my garden by providing a variety of food. My nectar feeders didn’t appear to interest the butterflies (that I saw) but at the moment the plants in my front garden are. Understandably known as the butterfly bush, my young Buddleja with only a few flowers is proving very popular as you will see here in a few of many photographs taken. Considering the butterflies will pass this way I have increased a planting of sedum earlier this year which is nearing flowering time. Winter damaged plants that were left to regrow sadly haven’t. So planting space free, with a bit of revamp to my window border we have the return of Verbena Bonariensis. Yep… Verbena Bonariensis will be a very popular tipple in my butterfly mini bar when it flowers. I’ve a plan in mind to protect it this winter and plan to take cuttings too. Oh yes… and I have a pkt of seed to make sure I have some plants for next year. As ever, I am optimistic that I will see new species arrive in my garden one fine, sunny day. This gardenwatch blog has shown me to expect the unexpected and always to keep a keen eye out the window! Looking out my window tonight to wet, windy weather where bird feeders have been knocked off their tree hooks my thoughts went to the people and wildlife of Texas as wildfires rage there. I hope my blogging friends are safe and well. 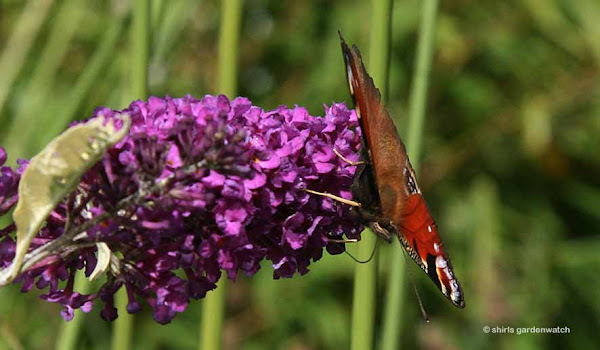 Safe and enjoying the Buddleja in my garden on Sunday were bees and a Peacock butterfly. 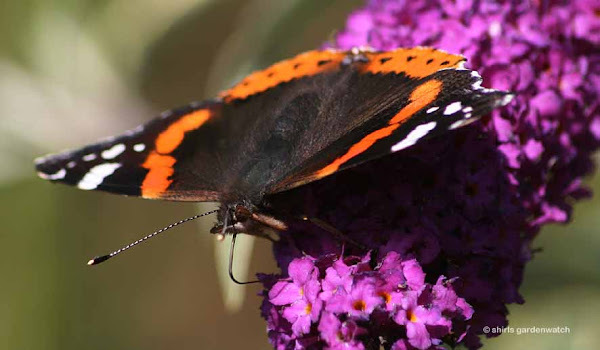 Safe too yesterday was a Red Admiral butterfly - although it did have a challenge holding on during gusts of wind. My eye is always drawn to the eyes of the bottom wings of the Peacock butterfly. Wings out fully like this it isn’t easy to miss. when it feeds vertically with its wings tighter together. In contrast, the Red Admiral is easily spotted when it feeds vertically. Most butterflies can be easily missed when their wings are folded completely up and they show their camouflaged underside pattern. Photos of the Red Admiral yesterday switched back and forth to the activity at the House Martin nest built at the front of my house. Youngsters could be heard chirping excitedly for food with the fledglings of earlier broods hanging around the nest too. I’m not sure how many broods we have had since nest building began back in June. Books suggest they could have 1-3 broods. 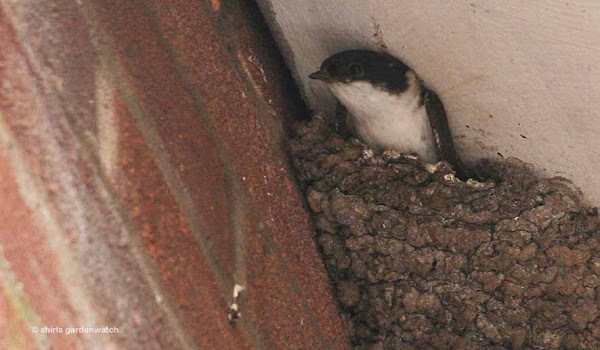 I might guess our House Martin nest has had three broods but how successful they have been I couldn’t tell. They are pretty high up under the eaves of our house and I have great difficulty seeing the camera screens when trying to capture images due to light coming in from the side angles. 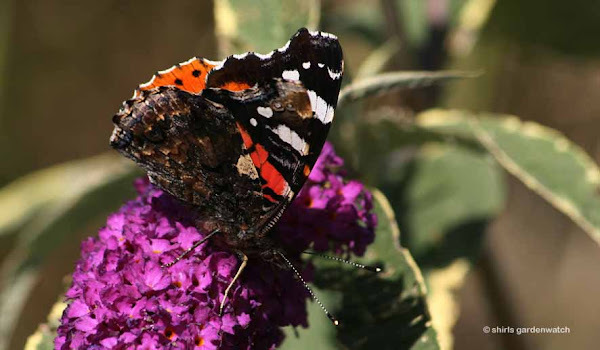 As it was windy yesterday and the grasses and bamboo next to my Buddleja were making a rustling noise I was able to get closer to the Red Admiral butterfly with my camera which was a bonus. Round in my shadier back garden there has been even more activity with late juvenile birds arriving at the feeders. Getting photos from my window is tricky and not so clear but I loved this shot with the juvenile Goldfinch with a sunflower heart taken at the end of August. Much fluttering of wings was done to get it too. 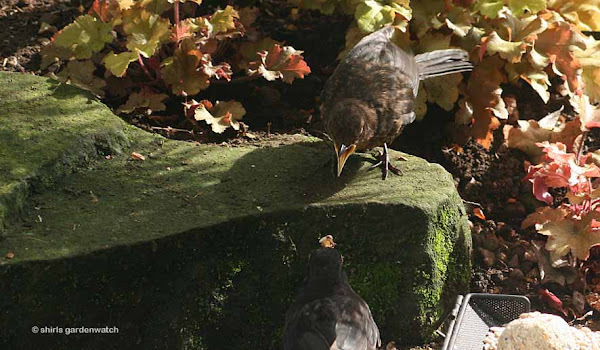 The middle of August saw begging Blackbird juveniles too. Note how close the seed feeder and fat ball is too! Taking photos in this area is a tad tricky too with extremes of shade and strong sunshine together. A little closer and a bit easier to adjust light levels for images is the area right under my window. I had to end with this shot of another juvenile and one that has been a delight to watch from my window. 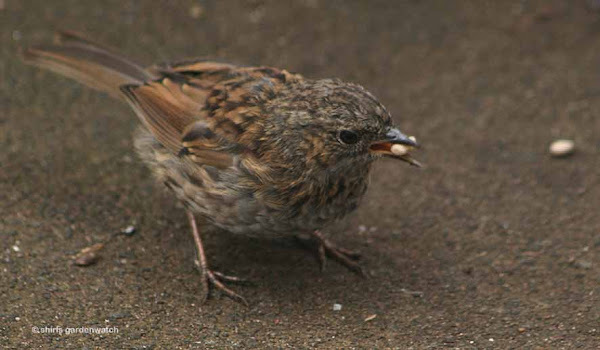 The Dunnock is more of an insect feeder but this juvenile has taken a liking to sunflower hearts. At a guess, based on when the first juvs were seen in my garden earlier this year, I’d say the Dunnocks may have had three broods but definitely two. I’d say both Goldfinches and Greenfinches have had two broods (maybe three). I’d also guess our Siskins have had two broods too. What a busy place the garden is isn’t it… then there’s the border revamps… just how many can a gardener have in one season? What are you up to in your garden just now? What birds and butterflies are visiting you? Do share them in a comment – we’d all love to hear about them. What gorgeous shots. The Peacock Butterfly is just so gorgeous.I wish we had them here. I agree with Lona. That peacock is a beauty. Of course all butterflies are pretty but I guess since we don't have this one it really stands out to me. Those eyes on the hind wing are marvelous camoflage. A predator wouldn't know where to strike. All your little birds are sweet. We have young house finches and Goldfinches in our garden too. Mostly coming for the water. Here it is still droughty. It is quite depressing. I haven't done anything in the garden but water plants I don't want to lose. It has been a terrible gardening season here. Lovely images of the butterflies. 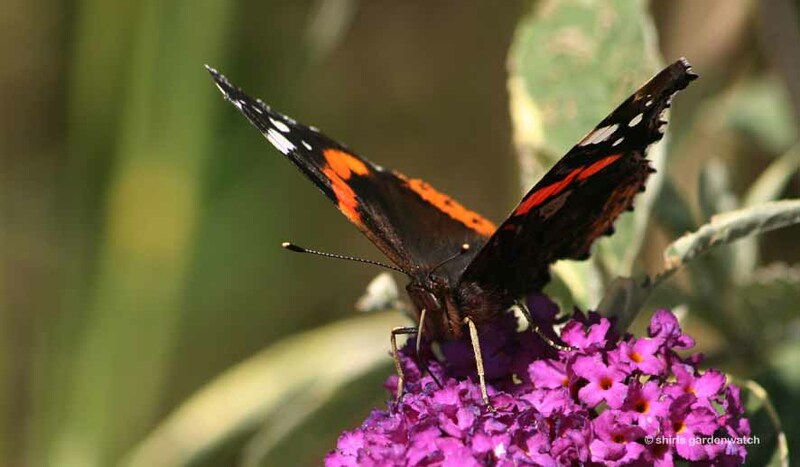 Our bushes have finished flowering already so the butterflies have all moved to the verbena. We lost all of ours last year but they had already self seeded. I'm also going to add sedums although I don't like the way they tend to flop! Really great observations and your butterfly pics are stunning. I am like you. I get butterflies but not by the hundreds. I'm also going to try and clump the butterfly plants together....and I think that should do the trick. This is the best time of year for our winged friends here in Tucson. They love heat and humidity! I was thinking of you today. The American goldfinches were feeding their young...didn't realize they had a second brood... and thought "Shirl has not posted for quite a while". Glad to read yours tonight. Planted four buddleja last year..and they are busy now, with hummingbirds...steady... The monarda is finished, so, glad I made more of an effort for them. As always, your photos and dialogue are encouraging and inspiring. What beautiful pictures - I'm very envious, especially of the butterfly ones, as I spent ages wandering carefully around my garden stalking butterflies just to try and see what they were (let alone photograph them)... Lovely! A brilliant series of photos all round Shirl. Visiting flutter numbers here have been well down on previous years. My Buddleia flowered very early, too early for butterflies and the heather has only attracted a few whites, but plenty of bumblebees. The idea of a 'nectar bar' sounds a good idea. Goldies have had two broods here also and their numbers are recovering well after two years of finch disease knocked them right back. 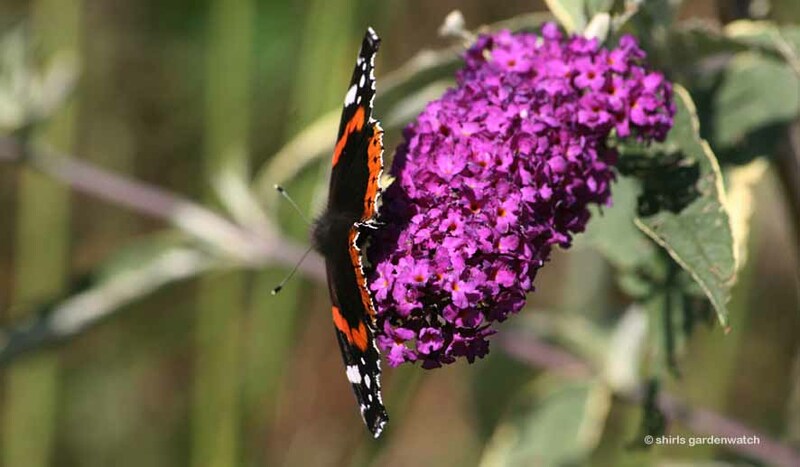 Our buddleia is over now as it flowers earlier and this year not a butterfly in sight on it. 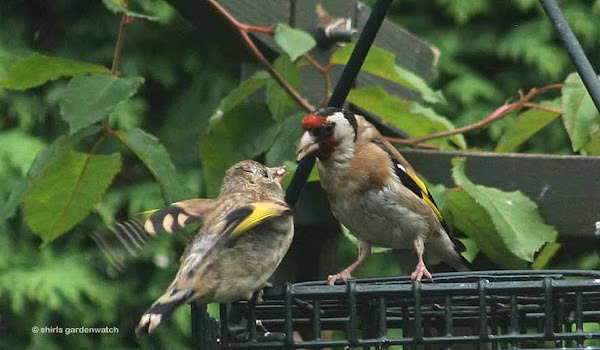 Our garden is full of young birds - I counted 18 goldfinches feeding on our ground feeding table. (I posted a video on my blog). They are starting to get adult feathers so are well past the being fed stage. Hi Shirl, very taken with that young goldfinch and who doesn't like a dunnock? This much further south it seems to have been a pretty good year for butterflies - certainly having VB in flower for weeks now has helped. 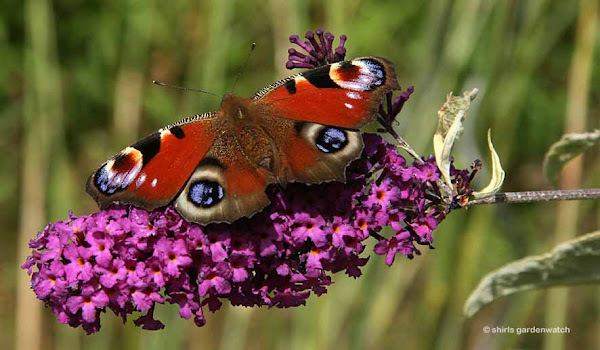 Beautiful photographs of birds and butterflies, they add so much extra colour and movement to the garden don't they? One of the best flowers to attract bees and butterflies is Eupatorium atropurpureum, they love it in my garden , it is always covered with visitors. Lisa, ah… didn’t realise until this post that you don’t get the Peacock butterfly with you. I guess with it being one of the species tracked here in the UK as a first sign of Spring that should have given me a clue. You’re right on the eye markings… I didn’t know the bottom wings were named ‘hind’ thanks for that. Oh dear, your drought sounds like it has almost spoiled your garden for you this year. I bet your birds really appreciate the water you put out! Hi there Christina, sorry about the delay in my reply. There has been a reason behind my absence. It has been a difficult time. I do hope all's well with you, and that you didn't suffer too much storm damage earlier this week. Your blog has some incredible photos as well as great posts.